1. Down Rowing will have central constitution that all members will be part of. We will need to review the draft central constitution & in so doing take names. 3. Tools – I have have been told that any normal DIYer will have the tools needed. Also the boat kits are now all in Portaferry but some extra timbers will be needed. The timbers for keel stem & gunwhales will now be funded from SLLP but advises that strengthening wood to brace the building jig as well as consumables protective clothing gloves masks hand cleaner etc etc will have to be funded locally – I am guessing guess at a manageable £250 but it might be no more than £500 local. I assume we have to add the cost of the oars to that. All buildings were capable of being made good for the purpose of making the Skiffs however there were varying amounts of work required to make them ready for use along with tenancy issues. The shell and structure of the building was in good order. The area identified as suitable for building the boat was an actual ‘Cold Room’ used for fish processing. The room had no electric fitted but if connected to an electric supply could be temperature controlled and ventilation supplied. Similarly light and power points would be needed. Currently there is no water or toilet facilities, no direct ventilation or natural light. If working inside the main doors would need to be left open. The building is currently unusable because of the lack of facilities, services and ventilation. Mr Mulhall stated that he could get someone to put the services and facilities in place. Currently the building is not accessible as there is no tenancy agreement. Mr Mulhall said he felt it was possible to obtain an agreement. Mr Mulhall’s organisation ‘Street Safe’ is a charitable organisation and so can get the premises rates free. The ADA building is structurally sound and in good order. An area identified as main floor of the former shop would be suitable for constructing the boat although it may possibly need segregated from the rest of the building in some way during the construction period. This will depend on the future use of the building. All required facilities & services exist i.e. electric, water, toilets etc. (no disabled toilet). The building is more or less ready with very little required to bring the building into use for constructing the Skiff. The group would have access straight away and the only concern would be asking the current users (craft class) to move or vacate the building. This building is modern and structurally sound. However there is no water or toilet facilities. It is currently used for the repair and storage of boats and material used in the fish processing business. The location of the building and access are quite remote especially if it had to be used at night. Mr Mulhall stated that he could get the water and toilet facilities put into the building. Hendersons have been in contact with ADA offering the Cochrane old shop for a period of (9) nine months which can be followed by a further nine month if wished for. A draft constitution has be drawn-up, copy to follow. SLLP are holding a meeting in the Arts Centre in Downpatrick on Friday the 7th March at 7pm for the proposed management team to consider the draft constitution and give you an update on, insurance, team funding and any issues that might arise. As part of that committee can you please ensure that you or your representative from your team can attend. This will be followed with the 1st General meeting of the Down Coastal Rowing Club on Monday 10th again in Down Arts Centre at 7pm for all existing team members. If there is any difficulty please come back to me. Money required to purchase equipment and materials over and above the items SLLP are supplying will have to be met by the Team. With the proposed constitution you will not need to hold a general meeting, elect a committee or open a bank account for your team you will only need to adopt the structure we have already suggested. The most urgent thing if you have not already done so is the election of a Team Captain and a structure for your team. Before the Club is formally created, at the general meeting, and everyone joins your team can start work as ‘volunteers’ for the Strangford Lough and Lecale Partnership. As long as those names are lodged with Gillian beforehand as volunteers they will be covered by the SLLP insurance. This is on condition that no powered hand tools or machinery powered from the mains is being used until a electrical cert. has been obtained. A lot of power tools nowadays are battery powered and so can be used safely without being plugged into the electrical system. just to let you know that I chaired the inaugural meeting of the Ardglass Branch of your organisation last night in my capacities as being on the Strangford and Lecale Partnership and as a local councillor. It was held in ADA’s premises in Bath street. 3. Will the kits come with tools? or will we have to find or buy them? GOOD NEWS FOR WILDLIFE!! For the last 6 years+ I have been trying to get bye-laws passed to protect shore-nesting birds and seal pups from disturbance during the breeding season. The DOE delayed us for years – but now our bye-laws will be going for consultation in the next few weeks. Take or print a few copies of this document for your friends as anybody who uses Rossglass or Minerstown beaches can submit an opinion, not just those of us living locally. These bye-laws are the first in Northern Ireland by a Council specifically to protect wildlife. They are a precedent that can be used to protect wildlife in any other part of N.I.. This is why myself and others have campaigned for years to get this result. Similarly there are only a very few patches of shingle along the coast where mechanised vehicles need to avoid squishing plover or other birds nests – these areas need our protection. Information boards are vital here. Once most ordinary decent people are told why they have to keep their dogs on a lead near seal pups, or keep dogs 200 meters from newly pupped seals they make a point of doing so. Anyway we have 100 kilometres of coastline to let dogs run free!But these bye-laws also authorise public officials to take action where needed. Independent Councillor Cadogan Enright chaired the inaugural meeting of Down Coastal Rowing Club (Ardglass Branch) was held Wednesday night in the village at the Ardglass Development Association (ADA) drop-in centre in Bath Street. A steering committee was formed to fully set up the local group. Local enthusiasts formed the Ardglass branch of the Down Coastal Rowing Club (DCRC). 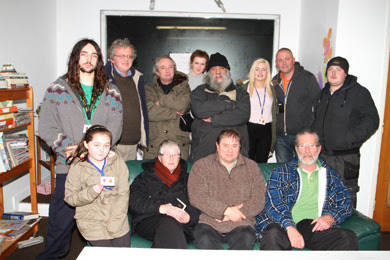 The DCRC emerged from an initiative pioneered by the Strangford Lough and Lecale Partnership and the PSNI. The aim is to build eight 22-feet wooden St Ayle’s skiffs in local coastal communities and ultimately have them take part in regattas and events along the Lecale Coast and in Strangford Lough in a fun and on a competitive basis. If you think you may have a useful set of skills in boat-building such as woodworking, painting etc, why not get involved? It is expected that each skiff takes up to 800 work hours to complete and a team is required to see this project through. To express you interested initially, contact Mary McCargo, 028 44 841575, Cadogan Enright at 07590462329 or Jim Masson on07855545873. Councillor Cadogan Enright chaired the inaugural meeting of the Kilclief Residents Association (KRA) last Friday evening for the appointment of officers. Registration forms for the new association were completed and grant forms filled in. It was decided to produce a leaflet seeking other potential committee members around the area and to circulate a list of priority issues that had been raised at the meeting to see if this could be improved by other residents ahead of another general meeting later in the year. Initial concerns included a obtaining a 30-mile an hour zone for the village, a play-park for children, ensuring Kilclief beach had “EU bathing water status” and funding for summer schemes later this year. Local residents discussed various potential locations for a potential play park, and undertook to approach local landowners. It was noted that surrounding villages had all managed to get a play park of some kind, and given the number of young children in the village some facility of this kind was essential. Kilclief residents passed a motion passed to write to the Ardglass Development Association pledging support for their campaign to get EU registration for Lecale beaches including Kilclief. This had the objective of achieving EU registration to ensure that NI Water can no longer legally discharge untreated sewerage in waters in our area, which will bring both social and economic advantages to our area, especially given the importance of the tourist trade locally. I HAVE POSTED HERE BELOW A SCANDALOUS SERIES OF EMAILS WHERE COUNCIL ARE REFUSING TO PROVIDE ASSISTANCE TO CONEY ISLAND. CLEARLY THE SDLP AS THE LARGEST PARTY IN COUNCIL COULD DO SOMETHING ABOUT THIS IF THEY WANTED TO. I will keep adding to this as the saga unfolds until they are embarrassed into doing something about this scandal. in the absence of a reply on this issue, I am therefore proposing a new wording for the Notice of Motion. I note that this is the seventh notice of motion since the last AGM from myself that council management have sought to suppress. “Council notes that province-wide agreements, arrangements and protocols reflected in the Councils emergency plan for dealing with floods and other emergencies currently prevent some villages being offered assistance if the Roads Service does not recognise the roads serving those villages as public roads. Council management have explained that they do not provide assistance either as they follow the ‘Lead Agency’ in emergencies of this kind. For instance Roads Service is unable to provide flood protection to Coney Island during tidal surges, so Down Council would not either. I am copying other Councillors for information. Can you explain how we can protect areas like Coney Island if, as you suggest, we can only follow the lead of other Agencies? The problem is that your “province-wide agreements, arrangements and protocols” that you refer to below are wrong, and need to be amended. Your proposed Notice of Motion will, if adopted, by the Council, cause us to break province-wide agreements, arrangements and protocols. The Council’s role in an emergency is to follow the advice/guidance of the Lead Agency. Depending on the emergency the Lead Agency may be the DRD, Health Trust, Ambulance Service, Fire Brigade, Rivers Agency, etc or the Council. To adopt your proposal would mean we would have a priority action that may well affect our ability to provide the support asked of us by the Lead Agency. In the last flooding emergency the Lead Agency was the PSNI and they provided us with important information and advice on the areas of greatest risk and where we should focus our limited resources. In an emergency we collaborate with others and collectively decide what needs done and who should do it. Last week our role was to support the DRD in the distribution of sand bags. The Council has no sand bags of its own, other than to protect its own property and its not our role to distribute sand bags to the public. There is a province-wide protocol that sets out who does what regarding sand bags and we signed up to that. To adopt your Notice of Motion would mean we wouldn’t be following the protocol. Finally, I do not believe that the response to an emergency is a matter of the Council, it is an operational matter and for that reason and the other reasons set out above I will refer your comments to the Council’s Emergency Team. The huge new housing development proposed for the Saul Road in Downpatrick, is going to be the litmus test of the sincerity and professionalism of the Roads Service and Planning Service in Down District. For years the Roads Service has been saying that any ring-road around Downpatrick must be ‘developer-led’. I.E. Paid for by developers of the land in question. This development parallels the route of the ‘Eastern Distributor Road’ shown in the development plan, and therefore must be built off that road, and not the Saul Road. Planners put this ring road in the ‘Area Plan’ for Downpatrick. It links the Hospital to the Belfast Road by crossing the Ballyhornan, Saul and Strangford roads in a wide arc. It would dramatically reduce congestion in Downpatrick, and allow the Southern side of the town to be developed in line with the expansion envisaged in the Area Plan. The new upgraded Sewerage plant was constructed to accommodate up to 20,000 people with this in mind. We were told that without this link road, development would be restricted on that side of the town. But instead of following the Area Plan, this development proposes to discharge onto the already congested Saul Road, orientated to overlook and dominate Ardenlee. This development should be orientated away from Ardenlee and built along the new link road. When the new hospital was built, they were forced to deliver the bit of the ring-road off the Ardglass Road roundabout . This development must be one of the next links in the chain. Developers need to understand that this vision for Downpatrick serves their interests too. The Roads Service and the Planning Service now have a chance to deliver what they have been talking about for years. If they fail, politicians must intervene. They should note that after the May elections Councillors will have the power to set planning policy, and will be able to insist that the Area Plan is delivered for the benefit of the whole town. If planners fail Downpatrick on this one, we will be left with congestion, an inability to deliver potential growth and jobs locally and with the Hospital ‘marooned’ on the wrong side of town giving the bureaucrats up at the Ulster Hospital a further excuse to cut our local services. Kitchen stools with posters on and clip-boards on top – works great – I got hundreds of signatures with them in Downpatrick Leisure Centre. AND you can put them in the back of a car and go to the next meeting or shop or Church. On a sports field you can lean on them and the legs go into the ground and they don’t blow over.